Even if they don’t want us to believe it, women need to shave too. We already know that they never sweat, but rather “glow,” and they never fart or have to use the bathroom. But even they have unwanted hair that grows on a regular basis and needs to be maintained, when they travel or leave home, just like us. 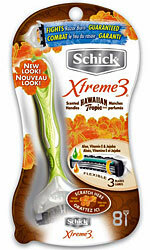 The Schick Xtreme 3 Hawaiian Tropic disposable razor was made just for them. Chicks like things that smell good — this is a fact. So what did the geniuses at Schick do? They made a razor that has the womanly scent of coconut built right in that never diminishes or goes away, unlike a man. The Schick Hawaiian Tropic is a temporary/disposable razor, but works with the effectiveness and feel of any full-time blade. It’s a disposable razor, but it’s a long way from what you normally expect from a disposable razor. The main thing I expect whenever I hear the term “disposable razor” is a certain overall level of cheapness — just a stiff piece of light-weight plastic with a shard of metal used to scrape the whiskers off your face when you’re in a hurry visiting the in-laws or on that business trip. One of the first things I noticed was the handle, and not just because it smells like a tanned, oiled, hot Hawaiian babe (which it does), but because the way it is structured is perfect for the grip of the most feminine of hands. Bumps and ridges abounded, making it easy to adjust the blade and hit hard to reach areas with ease. Located just above the triple blade setup is the “Comfort Strip.” The Comfort Strip delivers the ingredients Vitamin E, Aloe and Jojoba to your skin immediately after going over the area with the triple blades, which seriously reduces irritation. Another small thing I liked in particular was the razor cover. Most disposable blades I’ve encountered usually have a cheap plastic “slidey thing” (to use the technical term) to cover the blade when not in use. But the Xtreme3 had a cover that could only be removed if you pinched both ends at the same time; it was almost like a clamp, which is great if you’ve got this in the bottom of a loosely fitting gym bag, or if you have a curious four-year-old. Valentine’s Day may be over, but there will soon be another holiday that woman think was made just for them, where you’ll be forced to present them with a gift to show your undying affection. Next time you’re in that predicament, pick up a four-pack of Schick Xtreme 3 Hawaiian Tropic razors “for her.” They serve a practical purpose and show that you are sensitive to their most sensitive needs and areas.